In honor of Father's Day, I thought I would share a few of my favorite memories of a very special man I like to call Dad. I know, I know, there's a new father in our household, and maybe if he's lucky, he'll get a little blog tomorrow (or the next day...or sometime thereafter, but if you check out my archives, you can see that he gets blogged about quite a bit.) No, this day, I'm going to honor someone who has been a father for 35 years (sorry Ryan) and has gotten to be pretty darn good at it. There is one constant that always comes to mind when I think of my dad....our relationship with sports. From an early age, my dad had me involved in a variety of athletic activities. I can remember him taking me to swim lessons at the Mennen's pool on National Road in Columbus. He had me playing softball for Tom's Antennae out at County Stadium every Thursday night during the summers. He and I spent countless hours in our backyard playing pitch and catch. We had the whole backyard setup as a softball diamond and I remember always wondering if it really would have been a homerun when my swing would send one over our fence. I played basketball in elementary school because of my father's urging. I wasn't very good at it and by the time junior high rolled around, I was good enough to be the manager of the team that he coached. It was about that time that Dad started getting me involved in golf. Through high school, my dad was my personal coach and my biggest supporter. He carted me from one lesson to another and worked with me constantly to improve my game. I never had to work during the summers as long as I was out on the golf course practicing each day. (Rough life, I know.) Throughout my entire high school career, my parents only missed ONE of my meets because they were on vacation. (I came in 2nd at that summer tournament, but who's bragging?) To this day, you can ask my dad about any of my golf meets and there's a very high possibility that he can tell you who I played with, what I shot, and very probably, give you a play by play for each hole. After high school, I got a little burnt out on golf and sold my clubs. A few years later, I got the itch again and within a couple days of me telling my dad that, he had a new set of clubs for me. Even though I don't have the time these days to play, I will always love the game, and probably the biggest reason is because it reminds me of the times I spent with my dad. Most kids when they are growing up go through a phase where they can't stand their parents or they are embarrassed by their mom and dad. I don't ever recall feeling that way. I was always proud to tell people who my parents were. My dad taught Industrial Technology at one of the middle schools in Columbus and coached several different sports at the junior high and high school. Everybody loves him. So, it was always with a sense of pride that I could say, "Yeah, I'm a Cooper...Jack's my dad." When I was in 7th grade, we worked the schedule so that I could have my dad as a teacher. Again, I think most kids might not want that. My dad and I agreed before class started that we wouldn't make an issue of me being his daughter...if someone asked, we'd be honest, but we weren't going to introduce it on the first day or anything. Well, my dad, not trying to show any favoritism or anything, asked ME to pass out some papers that first day of school. One of the male students said to me, "Thanks babe," to which I replied in my most feminist voice, "What did you just call me?" And, he repeated it again. So, I turned to "Mr. Cooper" and said, "DDAAAADDD!!! HE JUST CALLED ME BABE!" The whole class just stopped and stared in disbelief! But, I never really got any special treatment from him. (Did I, Matt Dingledy?) I loved riding to school with him in the mornings. I would sit at his desk and play teacher before school started and it was the highlight of my day to be able to write the announcements and schedule up on his chalkboard. After college, I lived with my parents for a few years and taught at an elementary school in Columbus. Most people would HATE living with their parents at that age, but I LOVED it. I probably would have lived with them longer if they lived in a more "happening" city. And, no, I'm not ashamed to say that...my parents are pretty cool people to hang out with. But, when I made my move to Indianapolis, my dad gratefully helped me pack and helped me move. When I left one apartment for another, guess who came up to help me load and unload the truck? And, he did it again, and again....without complaining. On one of my last moves before coming out to California, I sprained my ankle by clumsily falling down the stairs. I didn't realize it was sprained until the following morning when I could only CRAWL. I called my dad who said, "Well, did you ice it, dummy?" Um, no I hadn't. My parents immediately left their house and came to pick me up in my apartment to take me to the doctor. Unfortunately, I lived on the 2nd floor and having the two of them on either side of me just wasn't working to get me down the stairs. So, what did my dad do? He used his super human strength to PICK ME UP and CARRY ME down the two flights of stairs and into the car. How he didn't break his back is beyond me. But, it is proof that he would do just about anything for me. My dad is my go-to person when it comes to making things and fixing mistakes. Dad, can you make me a corn-hole set? Sure thing. How about a birthing stool? Sure would if I had the tools. Hey, can you clean my windows and window screens while you are out for a visit? I can and I did. Do you mind fixing our sprinkler system - we are watering dead plants!? Well, I just had outpatient surgery for my bladder stone, but no problem. There, I saved you $300 a month. Um, I need these pictures and shelves hung up in Olivia's room, do you mind? Where's the level, I'll have them done in no time. My dad has so many wonderful qualities that make it easy for not only me, but other people to absolutely adore him. For starters, he wears his heart on his sleeve. 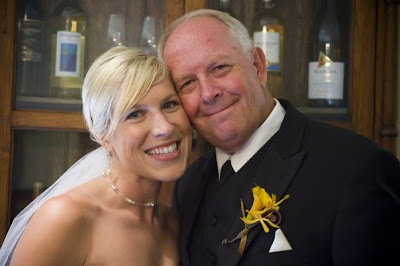 Seriously, my dad has probably been crying since the title of this blog. He is a sap when it comes to his family and the people he cares about. My mom and I always get worked up whenever he has to give a speech about us or one of his golfers because he gets choked up really easily. He has also never met a stranger. My dad could make friends with just about anyone. I STILL have people from the wedding saying to me, "Your dad is so cool. We would love to hang out with him again." We don't know what might come out of his mouth during a conversation - care to hear details of the outpatient surgery? - but he'll be down to have a chat with just about anyone. And, while we are on the subject of talking, he's a pretty good listener too. When David needs to vent, he sometimes does it to my dad. He's really good at knowing when to keep his mouth shut and when to step in with some advice. (If only he was good at doing that with Mom...) It is so amazing to see the relationship that he and David have now. I love watching them together - talking, shooting guns, playing golf, harassing me! He treats David as a son, and I don't think there is much more that I could ask for. 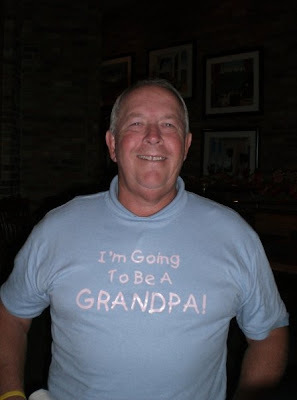 And, as I mentioned earlier, my dad would give you the shirt off his back if you asked him to. He is especially a softy when it comes to me. When my parents were here after Olivia was born, I had a hard time dealing with the fact that, yes, they were going to leave to go back home at some point. They decided that Wednesday morning, after 16 days of being here, would be the day for them to leave. Well, Tuesday night, I had a little breakdown and begged them to stay one more night. I got the infamous stare with the beady eyes from my father that told me he meant business as he sternly said to me, "One more night, but when we leave on Thursday I don't want to see any tears!" And, he didn't. Well, at least not from me. Now that I am grown-up, (Come on, are we ever really "grown up"?) and I have a daughter of my own (I have a daughter!!! ), it is SO amazing to see him with her. His face just lights up when he is around her or even sees pictures of her. The day she was born, I swear he filled his phone with pictures of her and had probably sent messages to half of Columbus. Even before she was born, Dad was broadcasting the news all across town. When we were in San Diego over Memorial Day, I needed to get in the shower while Dave was at the hotel gym. I called my mom to see if she could come watch Olivia for a little bit, but she was in the middle of getting ready too. Without missing a beat, Dad was over in the room ready to hang out with her. While they were out here, he went with me to every one of her doctor's appointments and carried her car seat even though he was in an enormous amount of pain. There's one he can hold over her head when she's older! I am so fortunate to have such a wonderful relationship with both of my parents. I am able to look back at my childhood and pick from a plethora of special moments with each of them. I am forever grateful for all of the things that my father has done for me and I know that no matter how old I get (or how I may be replaced by my children), I will always be Daddy's little girl. Your Dad told me to post this because he couldn't see through his tears. SO after I wipped away MY tears, here goes, we both thought that was an amazing tribute. 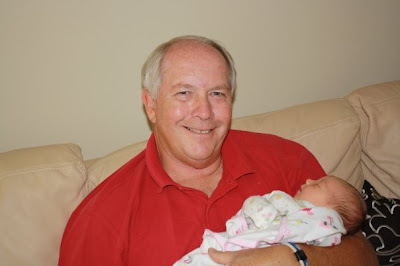 Your Dad said you make it easy to be a good father and he is now looking forward to being a good grandfather to Olivia. And yes, you will always be his little girl!! If every little girl grew up to have such wonderful memories of younger days with their Father, the world would be in a much better place. Lucky you. Lucky Olivia. I LOVE this post and I LOVE your Daddy! I didn't know that your Dad taught you, that story is so cute. It is easy to see why you have such a wonderful relationship with your parents, and it's even more evident as to why you'll be an amazing parent yourself. Irma is right; lucky Olivia!!! :) Miss and love you and see you three in a few days!!! Well now Sis.....this is one of the best blogs on here! It made me tear up! He is so awesome, I just really love your parents. But seriously when Olivia was born he could not put his phone down to tell the world! He was so proud! Cute, cute, cute! Haha! I forgot to put in the part about how he calls me Sis. I'm so used to it, I guess. When I played softball, I remember him saying, "Run, Sissy, Run!" and I was soooo embarrassed, and poor thing, he couldn't understand why. I love him though. He still calls me Sissy sometimes instead of Sis. I wouldn't know because you weren't in my class!